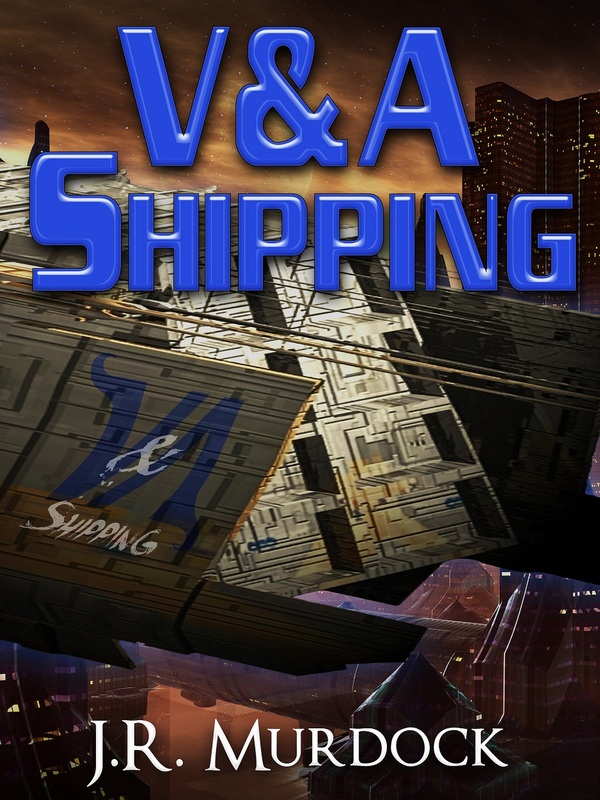 ← V & A Shipping – The Backstory! Vic didn’t watch to see if Argmon had completed the task; he knew it would be done. Argmon, after all, was a four-armed, bipedal, dog-like being called a Shathar, that piloted the SS Acid Rat. Vic knew Argmon was great at taking orders, even if he was a little temperamental at times. They had precious little time to prepare. Vic adjusted controls that would keep the ship from veering out of control once they were struck. His plan was simple: use the blast’s impact to change course and jump to hyperspace before a second shot could be fired or their course projected. They would then be safely away and could change course once they were out of the solar system. Their pursuers were, as had been their misfortune to have been detected, the fuzz. Despite their caution in getting the ship loaded, and following all the proper procedures in taking off from the planet, even with false confirmation codes, had done them no good. Someone had tipped the authorities off, and now they needed to get away. Argmon growled a deep, husky affirmation. Vic looked at him. The pilot’s cream-colored hair bristled out, making him look much larger. Argmon shuddered, and focused his attention on the controls; two hands on the helm and two hands on the controls to take the ship into hyperspace. Vic fastened his seat belt. He hoped the rest of the crew was already secured. There wasn’t time to make a general announcement, but they knew about the pursuit. The blast hit high on the starboard side. Stars blurred by as did the planet. The hit caused them to circle about out of control. Vic had to take his eyes off the view port and concentrate on the controls. He started hitting mini-thrusters and making adjustments while Argmon slowed the ship. A warning light went off blinking blue then green. The stars slowed considerably, but it was obviously the intent of the police cruiser to knock them out of control and thereby preventing a jump hyperspace. Vic couldn’t recall if the planet they were leaving had moons or not, but there was no more time to worry about that. It was time to jump. The planet swung into view along with the blue and gold police cruiser. A port on its massive underside opened in preparation to engulf the SS Acid Rat and haul them back to the planet. Would there be a trail or would they get out of this one? The engines hadn’t charged enough or they would have tipped off the police cruiser to their plans. The engines had only enough juice stored for a quick burst. They could be at least two light years away with time to charge the engines for a longer burst and be on their way. They would have to make three or four more stops to ensure they weren’t followed, and then they could head back and drop off the shipment. Joey Provoski held the soldering iron carefully and lowered it ever so slowly to the junction of the resistor lead and the circuit board. A tiny wisp of smoke drifted up and into the air as the solder melted, its internal flux core melting away and leaving a shiny joining. Joey smiled. He placed the iron on his work bench. It was really his desk and he was supposed to be finishing up his homework, but he was a high-school senior — he was also eighteen and capable of making his own decisions — and he didn’t feel he needed to finish it just yet. There was plenty of time. It wasn’t even seven. Why should he stress out about getting homework done when he could be fixing his grandfather’s old turntable? If there was one thing Joey loved more than fixing things, especially electronic things such as televisions, radios, and record players, it was listening to music. When his grandfather had passed away he’d left Joey all his old stereo equipment as well as his entire record collection. Most of it consisted of great bands from the sixties and seventies. If he had a choice, he’d throw away his mp3 player and listen to records all the time. But this turntable hadn’t been working properly. That’s what Joey was doing up in his room instead of homework. The last parts were in place and it was ready to try it out. He had several other turntables and record players he could play this particular album on, but this turntable and record belonged to his grandfather and he wasn’t going to put the album on just any old record player. All he’d ever been able to download was In-A-Gadda-Da-Vida and he really wanted to hear the entire album the way the band had put it out all those years ago. All the pathetic remixes and remakes of the song made him squirm. Joey plugged in the turntable and ran the cord to the tuner module. The speakers were already hooked up and ready to start pumping out the sounds. The album was still in perfect condition despite his grandfather purchasing the original in 1968. In his hands was a piece of American History if there ever was one. The first platinum album ever. The biggest band of their era. The best sound anyone had ever heard. Finally after all the weeks he’d spent rebuilding the turntable, after all the trouble he’d gone through to find all the replacements parts, most of which could not be found at the local Radio Shack, and after all the care he put into making sure all the albums were preserved since his grandfather’s passing, he was finally going to be able to listen to the album. The turntable spun smoothly and quietly. Along the side were rows of dots. He manually adjusted the speed by picking the correct set of dots in a slim band of light until it looked like those dots stood still. The adjustments were made and he pulled the black album from its sleeve. He was careful not to touch anything but the sides and he slid the record over the middle spindle and watched as it started spinning. He lifted the needle and placed it ever so carefully onto the starting groove and all he could think was This is groovy, man. Joey struggled to spring from the bean bag, cursed, and rolled out of it in a vain attempt to save the album. He wanted to scream at her. He wanted to cry over the album. He wanted to… he wanted to… what? She had to understand how important this was, didn’t she? She’d just ruined a piece of history. It was forever ruined. Joey lifted the needle and dropped it back into the holder. He switched off the turntable and tried to asses the damage. Joey’s dad, Joey Sr., wasn’t much into music, but at least he hadn’t burst into the room and spoiled the moment of victory. He could at least fake interest in what his son was doing. Joey shook his head as he looked at the album. It was never going to be the same again and so many people had thrown out their old records or not taken care of them that he was certain he’d never find a pristine one such as this again. Never. His mom had ruined it and his father didn’t have the slightest clue as to just how important it was. Alice, who’d all but ignored Joey’s outburst and had been folding laundry stopped and narrowed her eyes at Joey Sr. and huffed a sigh. She gave each of them a peck on the cheek and left the room. Joey sighed. Perhaps he was, but then again perhaps his dad was just trying to downplay what had happened. Joey bit his lip. He and Carlos had gotten in trouble for shoplifting the year before and they weren’t supposed to be hanging out together anymore. Joey couldn’t help himself. Carlos was his best friend after all. Plus he had a massive collection of albums too. That’s why they’d become such good friends. “Well, we haven’t really.” Joey slipped the scratched record into its sleeve. Joey grabbed his jean jacket off his bed and stormed out the door. Posted on January 21, 2013, in V&A Shipping and tagged chapter, read along, v&A shipping. Bookmark the permalink. 2 Comments. Nice story beginning…waiting for my hardback copy to arrive.